Soetvlakte is a guestfarm in the Kuruman district right next to the R380- road to Botswana and borderpost Mc' carthy's rest. Soetvlakte offer a luxury 2 bedroom airconditioned guesthouse, a 4 hut bush camp that can accommodate 8 persons and camping facilities. We also offer B&B and other meals on request. Our Mission is to share the beauty, wildlife and tranquility of the spacious Kalahari with nature lovers that needs an unpolluted environment in which to refresh. 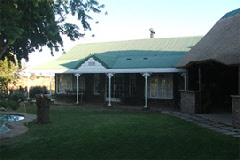 Our hospitality and cozy guesthouse will lead the way to an unforgettable Kalahari repose. Personal attention to your every need - only one guesthouse on more than 16000 hectares!! 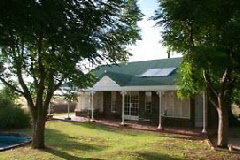 Luxury, two bed roomed (ensuite) guest house with lounge and open verandah. Cuddle up at the cozy fireplace on cold winter evenings or enjoy the abundant sunshine and 'splash' pool during our hot summer days. Camping: For the more adventurous ....... an outdoor campsite. We do take bookings for any number of people and give the camp to only one group at a time. Gemsbok Camp: The latest addition to the facilities at Soetvlakte is Gemsbok camp. A facility aimed at the tourist who prefers to camp with a caravan, tent or just sleep under the open sky, next to a fire. This is a Kalahari experience with the luxury of warm showers and flushes toilets, ala Soetvlakte style, and right in the veldt. 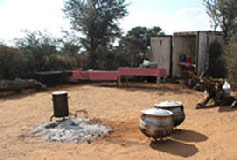 Our target group with this camp is for the camper or people on there way from or to Kgalagadi NP or Botswana. 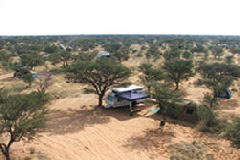 The camp is 10 camp spots under the camel thorn trees where one to three tents or caravans can camp per tree, scattered over an area far enough that nobody will be to close to each other. The 10 showers and 5 toilets are placed in easy distance from the campsites.